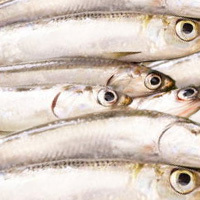 Japanese anchovy or katakuchi-iwashi in Japanese is a smelt-like fish that is used in the production of sardines and niboshi. It can be fired in batter or used in tempura in addition to being made into fish balls. A majority of Japanese anchovy is caught in the Hiroshima prefecture. The calories in Japanese Anchovy per 17g(1fish small edible part) is 33 calories. Japanese Anchovy is calculated to be 192Cal per 100 grams making 80Cal equivalent to 41.67g with 3.09g of mostly protein、2.06g of fat、0.05g of carbohydrates in 17g while being rich in vitamins and minerals such as Vitamin B12 and Selenium.